Day 2 of AniB’s Advent Calendar! And with it comes a review that is something I’ve wanted to cover for a long, long time- and also just so happens to sync up nicely with its sequel in theaters at the time of this writing- Wreck-It Ralph. Wreck-It Ralph is a fine film that is a bit of a unique spot from where it was released and the movies that surrounded it before and after. 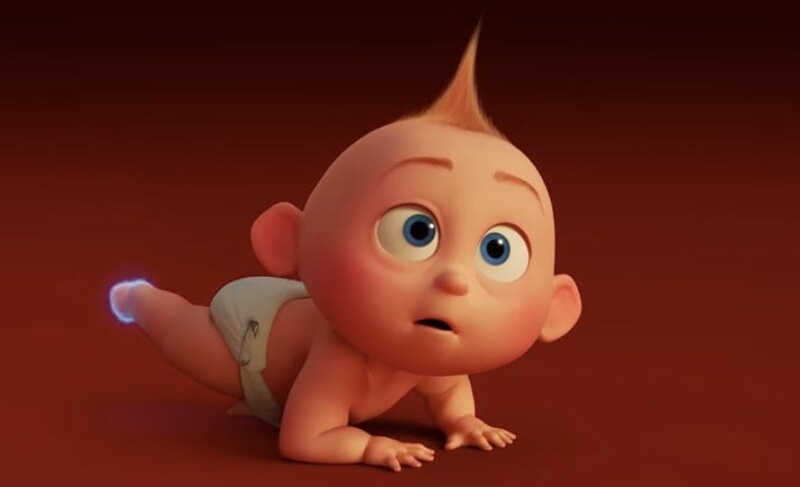 The so-called “Lassester Renaissance” period of Disney had started back in ’08 with Bolt, but didn’t really start to take off until this film…which then proceeded to get culturally overshadowed by cultural sensation Frozen the next year. Adding to this strange dichotomy was the strange feeling that Ralph seemed much more like a Pixar idea, whereas Disney’s sister studio had put out Brave that very same year…which felt much more like a Disney idea, right down to the princess and the themeing. Context aside, Ralph is a wonderfully creative film, and while the concept of a movie about video games had been tried several times before, Ralph was able to bring to life the enrapturing world of a classic arcade with all the vibrancy and references you might expect- while also packing a good story with great characters and a focus that worked. Indeed, Ralph’s core success laid in a few places, but none may have been more important than the insistence of focusing the narrative on original characters for the movie, while the actual games and characters that also populated the arcade were kept to some fun cameos that lent authenticity- but didn’t steal the show. 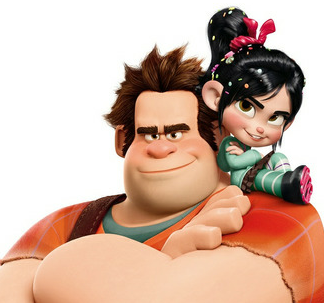 And how can I talk about the characters without noting the unlikely relationship that sprouts up between Ralph, the ham-handed, but big hearted titular protagonist voiced by John C. Reilly, and Vanellope von Schweetz, a saccharine-sweet little outcast girl from a racing game with more going on under the hood than appears? 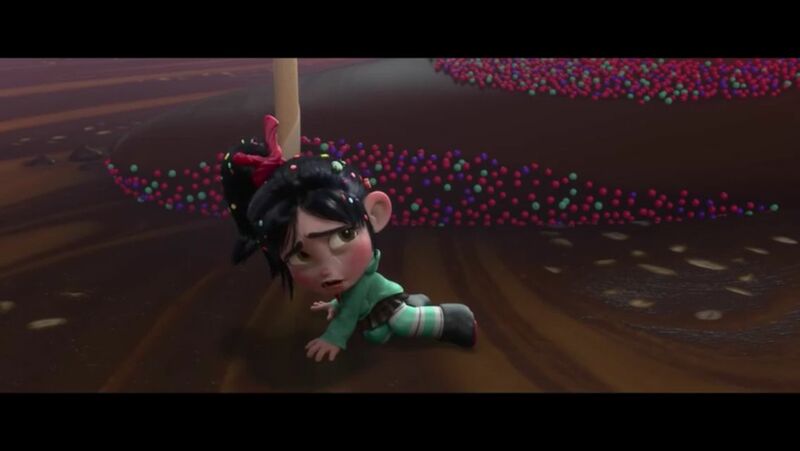 Winding up in “Sugar Rush” after his rogue quest for a medal goes awry, the wrecker meets his match in Vanellope, who outwits him at first while flashing a sarcastic side belied by her appearance. When it becomes apparent that she’s considered an outcast and a “glitch” in her game, the two begin to form an unlikely bond that can be best described as that of siblings in a way- but also close friends. This relationship forms the backbone of the best moments in the film, and actually creates some genuinely emotional moments, which is difficult to do in a vacuum considering the overarching subject material of video games. Speaking of characters, there’s also Alan Tudyk’s fantastic performance as King Candy, the self- proclaimed ruler of Sugar Rush, later revealed as the villainous Turbo. While Tudyk’s made it a habit to cameo in Disney films since this one, this was his finest work, as the faux regent was an homage to the late Ed Wynn’s work as the Mad Hatter. While people might rail on Disney’s twist villains in 2018 (and perhaps rightfully so), Candy proved to be a classically clever and deceptive individual, whose malice and cunning were revealed bit by bit in careful details that are really a treat to catch upon a rewatch. With a great concept brought to life faithfully in a way only animation could hope to achieve, along with a solid story and the types of characters that led the film, Wreck-It Ralph does in hindsight seems like a good pick for a sequel (which it recieved.) It’s also a favorite of yours truly, and honestly, just the details alone make it worth rewatching, beyond the enjoyably of the film. 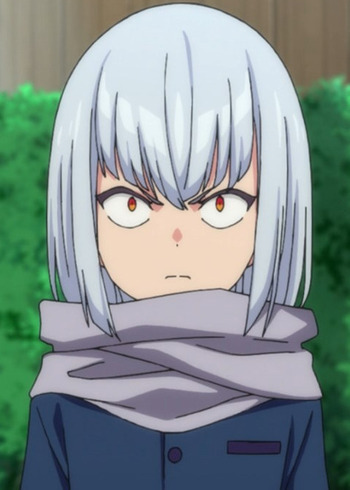 Is it perfect? Not quite. There’s at least one cringy joke in there, the supporting cast isn’t that deep outside of Fix-It Felix and Seargent Calhoun (more on them in the characters section), though this amounts to more of a minor complaint, and some corners will also contend the arcade wasn’t explored quite as fully as it could have been, especially considering Sugar Rush is the setting for at least half the film. That said, it’s a very good film with plenty of heart, humor and creativity- and that’s worthy of praise irregardless. Animation: Modern 3-D animated. The animation team for this film put in a stunning amount of work. Seriously, there’s material out there describing how much time was spent to get everything looking perfect in Sugar Rush with the various sorts of deserts and candies that made up the terrain. You can also see this sort of detail as well in other locales, from the 8-bit care of Ralph’s home game, Fix-It Felix Jr., to the hyper-realism of Hero’s Duty which is a fun spoof on first-person shooters. 5/5 points. Wreck-It Ralph is unsurprisingly, the titular protagonist. As the bad guy of a popular old arcade game, he’s sick of being antagonized both in and outside of gameplay by his fellow Nicelanders (the locale in which Fix-It Felix, Jr. is set) and is desperate for recognition for his role and that he’s not a bad “bad guy.” This leads him on a quest to prove he can be heroic and earn a medal like Felix, which while simple, is where things take off. 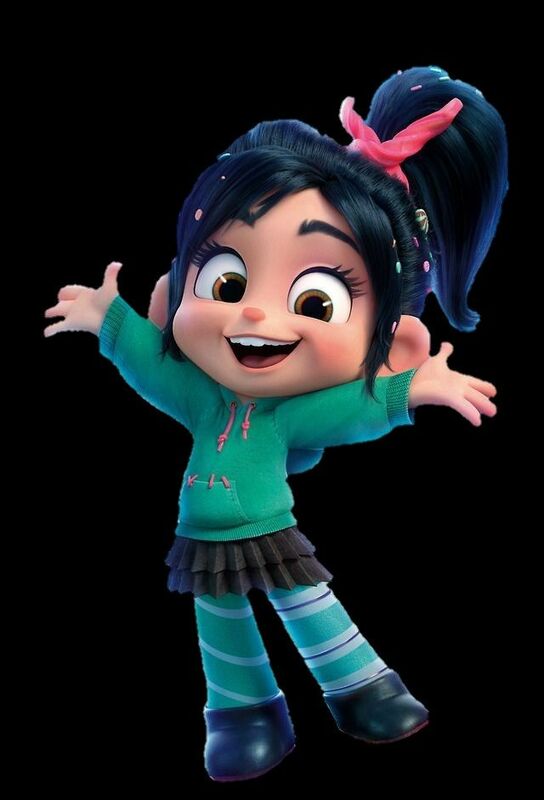 During the course of his misadventures Ralph runs into Vanellope von Schweetz, a silver-tongued chibi-esque girl in a racing game (Sugar Rush). 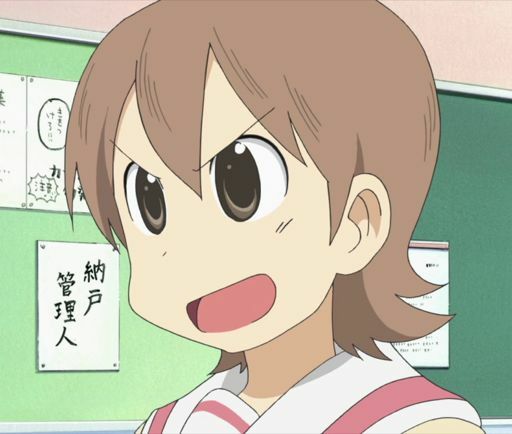 As it turns out, she’s a full-on criminal in the eyes of the candy kingdom’s current regime, though the reasons for that are unclear at first… Harboring a deep desire to be a real racer and have true friends, drastically different paths lead her and Ralph together into the unlikeliest of friendships. The main supporting cast isn’t that deep, but it’s adequate for this film. Far more impressive is the dizzying array of famous game characters who make cameos and lend authenticity to the film’s game setting- from Bowser of Super Mario fame, to Sonic the Hedgehog, and even Ryu of Street Fighter. Seeing how many you can catch while viewing is a real treat. 4.5/5 points. Story: This film is a character tale that has video games as its framing and backdrop moreso than a movie about video games, and I think that makes a major difference in the overall quality. It’s a story about finding one’s place; being more than just what people might say we are (“stick with the programming!”), but also a tale of resiliency in the face of long odds and seemingly insurmountable opinions. It’s a good tale which the characters really make, and so it’s graded accordingly. 3.75/5 points. Themes: There’s a powerful message in here about one’s self-worth, the strength of good relationships, and the dangers of self-absorptive love versus that of selfless giving and sacrifice. It’s not some overly complicated sort of morality, but it’s executed well in this film. 3.5/5 points. Don’t Insult the Viewer: A fun adventure for the whole family, there may be some mildly frightening scenes for younger children, but overall, the writing is good for anyone who’s viewing and the score is actually very good, capturing the atmosphere of the movie quite well. 5/5 points. Overall: 21.75/25 (87%): A fun film with vibrant, bright settings and the cast to match it, Wreck-It Ralph is an appealing movie that delivers an enjoyable watch, and a quality one too! A favorite for sure, it’s accessible to both people who love video games (and those who don’t) because of its narrative and cast. Like what you see? Enjoying the first 2 days of the countdown? Big fan of Wreck-It Ralph? Leave a comment!